PARIS -- Renault-Nissan announced plans to accelerate integration between the carmakers by stepping up joint projects in development, manufacturing, purchasing and human resources. The alliance partners have raised their goal for combined savings by 7.5 percent. The carmakers expect to save "at least" 4.3 billion euros ($5.83 billion) by 2016 by sharing more technology and resources, the companies said in a statement on Thursday. 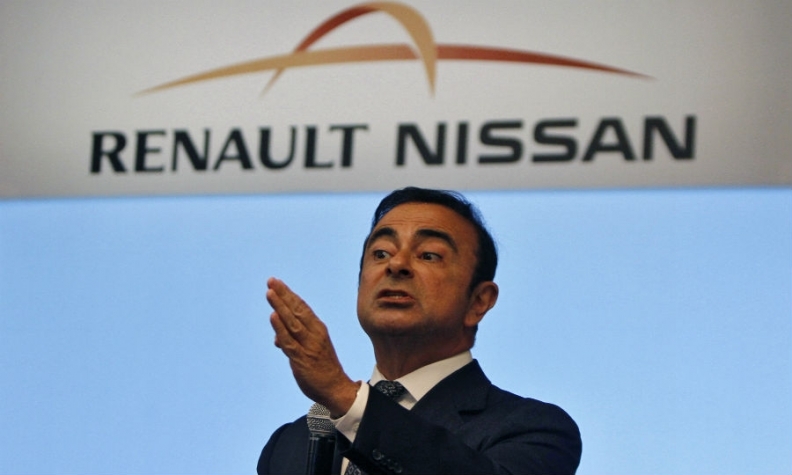 Renault-Nissan CEO Carlos Ghosn had previously targeted 4 billion euros in cost savings. "Renault and Nissan's partnership is fundamentally based on mutual respect and an attitude where all 'win-win' projects move forward on the fast track," Ghosn said in the statement. "With the new convergence projects, we will continue on the same path and with the same principles of respect and transparency -- at an accelerated pace." The automakers announced four new executive appointments as part of their plans. Christian Vandenhende, managing director of Renault-Nissan Purchasing Organization, will be the purchasing convergence project leader. Tsuyoshi Yamaguchi, the alliance's director of common platforms and parts, will be the r&d convergence project leader. Shouhei Kimura, Nissan's vice president for vehicle production engineering, will be the manufacturing and logistics convergence project leader. Marie Francoise Damesin, Renault's personnel chief, will be human resources convergence project leader. Renault has been Nissan's partner in sales and production since 1999 and owns 43 percent of the Japanese manufacturer, which in turn holds a 15 percent stake in the French carmaker. The alliance generated 2.69 billion euros in savings for the two companies in 2012. Almost 15 years into their alliance, Renault and Nissan are working steadily to pool more parts, technology and production lines globally. "The market has been waiting 14 years for notable synergies to materialize," Laura Lembke, a London-based Morgan Stanley analyst, said in a recent note to investors. "We think the alliance is finally entering the harvesting phase." A six-year market slump in Europe has helped to persuade managers at both carmakers to embrace deeper integration. "Now, when you explain to them that every euro we spend on duplication is a euro Volkswagen saves, they get it," a source in the alliance said. Alliance bosses say there are still no plans to upgrade the crossed shareholdings between Renault and Nissan with a full merger or any other adjustment to the current structure - which frustrates some investors because the French carmaker's share price fails to reflect the value of its Nissan stake. Ghosn has said integration cannot move faster without the kind of friction that has undone previous industry pairings, including Daimler's ill-fated merger with Chrysler. Another obstacle is the French government, whose 15 percent stake in Renault is fractionally bigger than Nissan's. The carmakers are introducing a modular-production strategy to build more vehicles together and lower spending, Renault said in June. Production began late last year from the alliance's first jointly developed mid-size car platform. Sharing underlying technology will help the carmakers cut engineering and development costs as much as 40 percent and reduce spending on parts more than 20 percent by 2020, Jean-Michel Billig, executive vice president of engineering and quality, said in June. Besides their new mid-size vehicle architecture, Renault and Nissan have stepped up cooperation in low-cost vehicles. A range of no-frills cars is already in joint development in India, spawning models for Renault and Nissan's Datsun brand. The carmakers are also taking joint control of Russia's AvtoVAZ this year and producing their own vehicles at its Togliatti plant, based on Renault's Logan sedan.